Immunosuppression that occurs during the process of tick blood-feeding has been reported extensively [20–23]. Saliva and salivary gland extracts are involved in the modulation of host immunity . Tick salivary gland extracts are composed of multiple proteins belonging to different protein families, such as the cystatin family, serpin family and Kunitz inhibitor family. 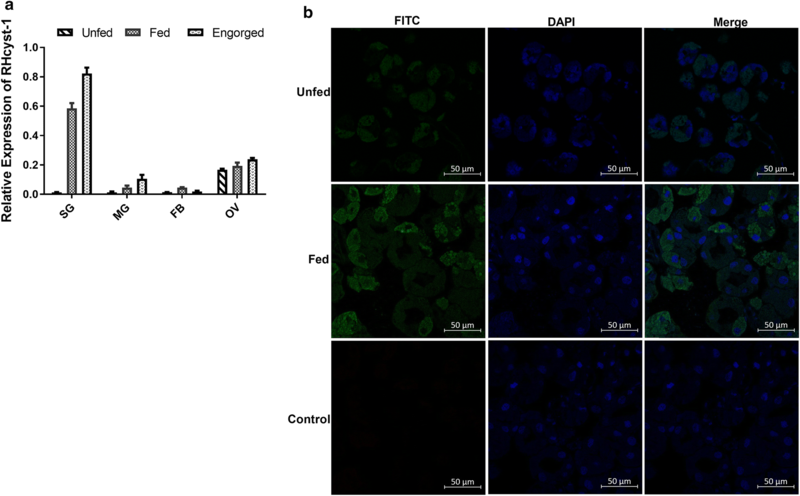 In this study, we found that RHcyst-1 is highly expressed in salivary glands and upregulated during tick blood-feeding (Fig. 1a, b). 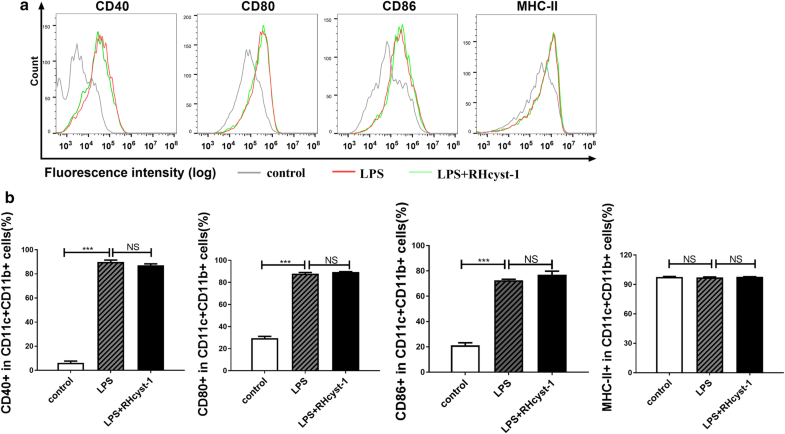 Our results demonstrate the immune inhibitory properties mainly on DC function of a salivary gland cystatin, RHcyst-1, isolated from the tick Rhipicephalus haemaphysaloides. Many tick cystatins belonging to type 1 and 2 families have been reported. Studies of the function of tick cystatins in the host have primarily focused on the type 2 family . In our previous study, we reported that RHcyst-1 belongs to the type1 cystatin family and is involved in tick physiology . 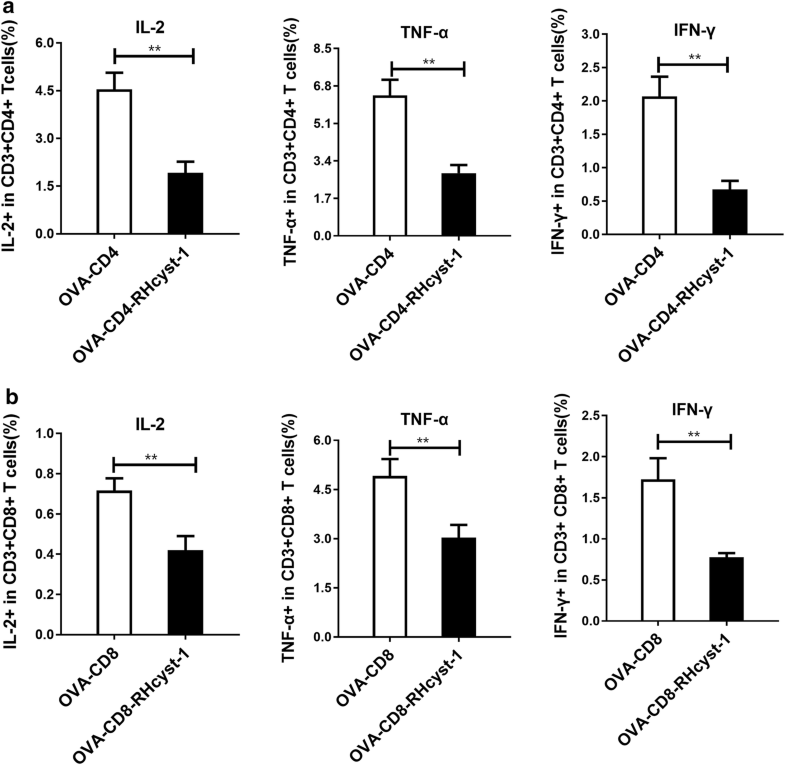 In this study, although RHcyst-1 was not directly detectable in serum from rabbits on which ticks had repeatedly fed (Additional file 1: Figure S1), previous studies have shown that RHcyst-1 has a broad spectrum of mammalian cathepsin-inhibition activities and mediates specific immune responses in tumor-bearing mice [13, 18]. Recently, exosomes have been most extensively studied and tick-derived exosomes were reported to mediate transmission of tick-borne disease [29–32]. Whether RHcyst-1, as the component of exosomes, enters into the host to regulate the host immune response remains to be further investigated. Protein phosphorylation is a modification of proteins and is the major molecular mechanism of protein regulation. The STAT and p38 MAPK pathways are tightly associated with DC differentiation [14, 19]. 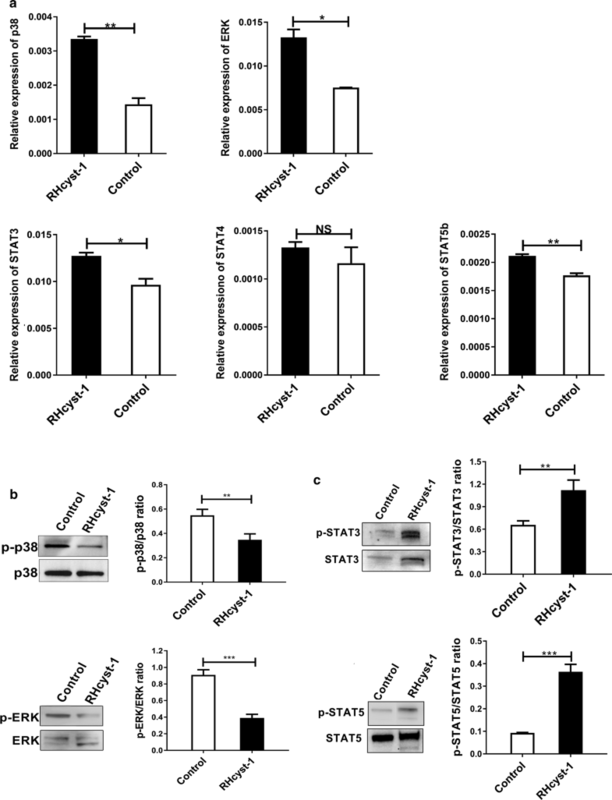 In the present study, we found that RHcyst-1, a cysteine protease inhibitor, inhibited the phosphorylation of p38 and ERK, but increased the phosphorylation of STAT3 and STAT5 during BMDC differentiation. It has been reported that cystatin from the murine nematode parasite, Heligmosomoides polygyrus, alters the T cell activating functionality of DCs . 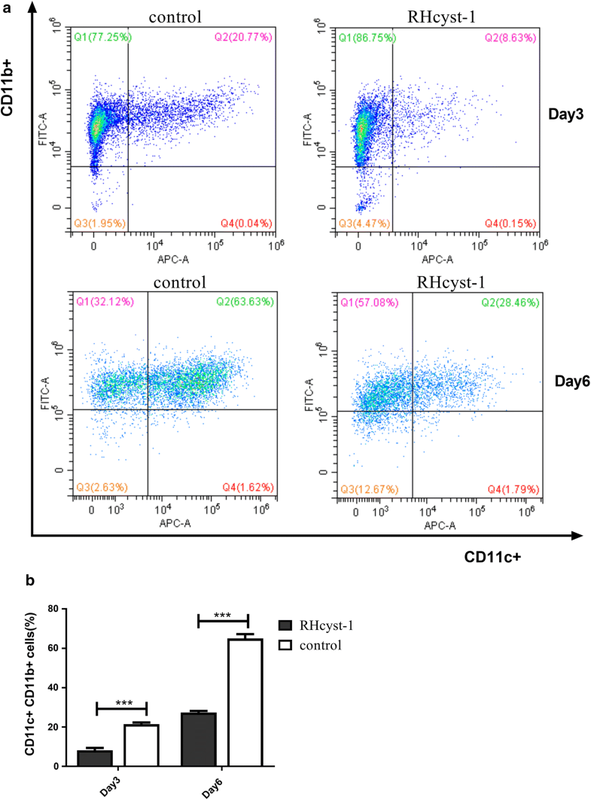 In this study, in addition to changes in STAT and p38 MAPK signaling pathways, we observed that RHcyst-1 treatment suppressed T cell activation by BMDCs. The observations made in our study may represent one of the important mechanisms by which blood-feeding ticks induce immunosuppression in their hosts. Regulating DC differentiation and function may be a potential strategy for ticks to promote blood-feeding and pathogen transmission. More effort is being done to study the critical roles of biologically important tick bioactive molecules in tick-pathogen-hosts [34–36]. RHcyst-1 may be a promising target for tick control in the future. 13071_2019_3411_MOESM1_ESM.docx Additional file 1: Figure S1. Western blot analysis of RHcyst-1. Total 20 μg of purified RHcyst-1 was electrophoresed in SDS–PAGE gel and then transferred onto PVDF membrane for Western blot analysis with serum from rabbits on which ticks had repeatedly fed (a) and normal rabbit serum as control (b).